Now, for the latest tales about left-wing lunacy . . . In other words, Montag is doing his impersonation of Democrat ex-congressman Anthony Weiner. When the latter was caught doing something despicable via an Internet account of his, he insisted that an investigation take place in order to find out who hacked into his account . . . except that nobody had hacked into his account. Like Weiner did back then, Montag wants people to believe that he is a victim of someone else’s dastardly deed. “A New Jersey community college has fired an adjunct professor after officials say she made racially insensitive comments on Fox News. Essex County College’s president announced the decision Friday, two weeks after Lisa Durden’s appeared on Tucker Carlson Tonight. College officials said they received complaints about Durden’s interview with Carlson. Durden, who is black, discussed a Memorial Day event held exclusively for black people hosted by a Black Lives Matter group. When Carlson asked her thoughts, Durden interrupted the host, saying: “Boo hoo hoo. You white people are angry because you couldn’t use your white privilege card” to attend the event. So, how should people respond to Phil Montag, Lisa Durden and Kathy Dettwyler? Answer: Like this . . .
To be fair, I wouldn’t label Rodman’s lunacy left-wing lunacy. Instead, I would label it out-of-this-world lunacy. After all, at the end of the movie Men in Black, we are told that Rodman is from the planet Solaxiant 9. 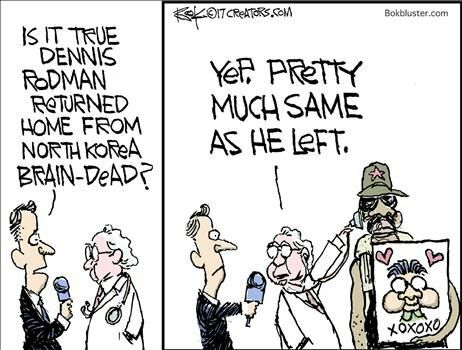 In one of his recent cartoons, Creators Syndicate cartoonist Chip Bok gives his explanation for Rodman’s lunacy. Click here to see that cartoon. Above post originally published @ The Moderate Voice, where members of the political Left dominate.